Today, Rockstar Games revealed the first details for some of the timed-exclusives coming to PlayStation players who decide to set out to the wild west on Sony's console. They're not wholly exciting to be honest. According to a new PlayStation blog, PS4 players will receive early-access to three Red Dead Redemption 2 cosmetics and weapons. 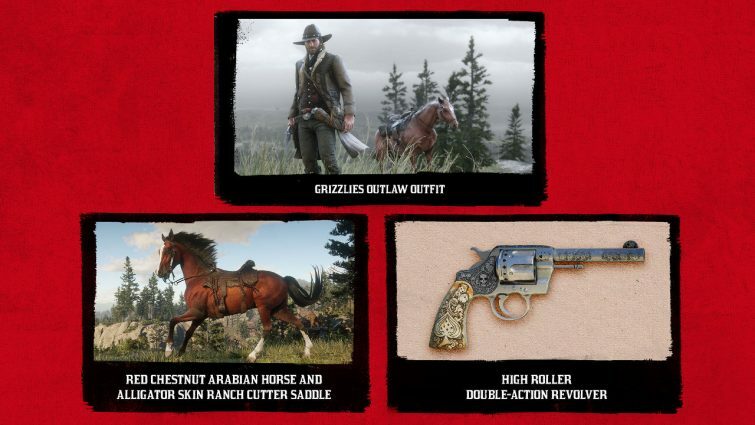 These include a Grizzlies Outlaw Outfit, the Red Chestnut Arabian Horse and Alligator Skin Ranch Cutter Saddle, and a High Roller Double-Action Revolver. The grizzlies skin will be available on day one of Red Dead Redemption 2, while the horse and revolver will be available at the launch of Red Dead Online. PlayStation has deals with other games as well including Destiny 2 and Call of Duty: Black Ops. These usually lead to timed-exclusives to certain items or maps. In comparison three cosmetics might seem somewhat disappointing. Still, these are no doubt just the first of other timed-exclusives coming to PS4 so keep your eyes peeled. Red Dead Redemption 2 is coming to PS4 and Xbox One on October 26. We had a chance to preview Red Dead Redemption 2 last week and came away with a couple new observations. For more, check out our Red Dead Redemption 2 guide for more details, trailers, and more. Tagged with Action Adventure,	News,	PlayStation 4,	Rockstar Games,	Xbox One.